If you are interested to read online version of this article, please go to the Manchester Evening News site. The article was published online and in the hard copy on 19 July 2015. Please also visit my studio.bartoszbeda.com where I posted the ‘Back in Manchester’ news. 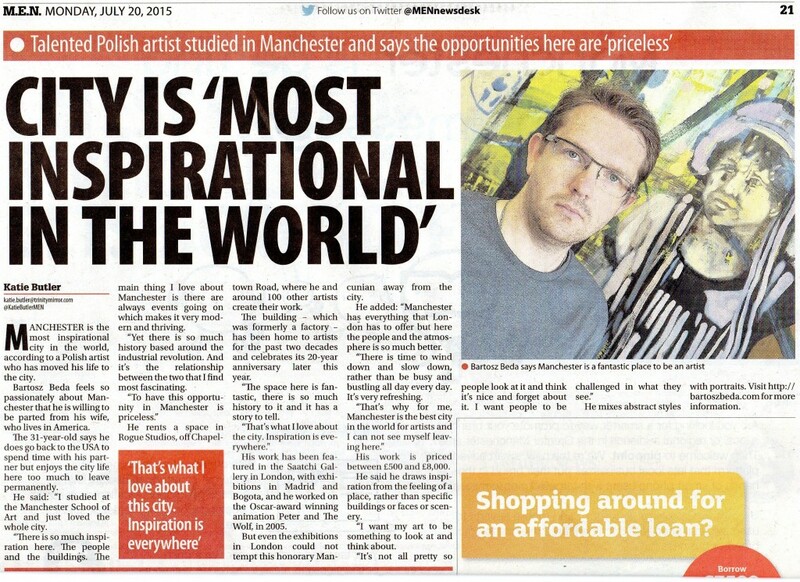 Manchester is the most inspirational city in the world, according to a Polish artist who has moved his life to the city. Bartosz Beda feels so passionately about Manchester that he is willing to be parted from his wife, who lives in America. The 31-year-old says he does go back to the USA to spend time with his partner but enjoys the city life here too much to leave permanently. He said: “I studied at the Manchester School of Art and just loved the whole city. “There is so much inspiration here. The people and the buildings. The main thing I love about Manchester is there are always events going on which makes it very modern and thriving. “Yet there is so much history based around the industrial revolution. And it’s the relationship between the two that I find most fascinating. He rents a space in Rogue Studios, off Chapeltown Street, where he and around 100 other artists create their work. The building – which was formerly a factory – has been home to artists for the past two decades and celebrates its 20-year anniversary later this year. “The space here is fantastic, there is so much history to it and it has a story to tell. His work has been featured in the Saatchi Gallery in London, with exhibitions in Madrid and Bogota, and he worked on the Oscar-award winning animation Peter and The Wolf, in 2005. He added: “Manchester has everything that London has to offer but here the people and the atmosphere is so much better. “There is time to wind down and slow down, rather than be busy and bustling all day every day. It’s very refreshing. His work is priced between £500 and £8,000. He mixes abstract styles with portraits. Visit http://bartoszbeda.com for more information.